You might confuse between CPM, CPC, CPA and CPL. 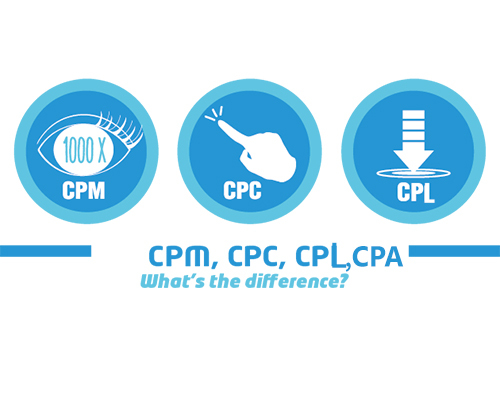 Today I’m going to tell you what is CPM, CPC, CPA and CPL so let’s get started. CPM stands for Cost per thousand impression and many of the company use the CPM to pay their Advertiser. CPM is widely used by large number of companies and CPM is demand for every Advertiser. Actually when your Ads are shown 1000 times they pay you 5-7 $ . Cost per click advertising is famous in all around world because it pay for every click. Some CPC Ad networks are Google Adsense, Adsoptimal, Infolinks, Clicksor etc. CPA stands for “Cost Per Action” in which Advertiser pay high amount to publisher when somethings are purchased from your site but it doesn’t like by publisher because it is very slow process and it takes much time to earn money but once you start earning it is very profitable. CPL stands for “Cost per leads” in which Advertiser pay you if there is any form fill up by your visitors on their Ads. It is very profitable for Advertiser to grow their email list. CPL is not to famous way to earn money for Publisher because widely no one is using CPL. In my point of view CPM and CPC are best and profitable for Publishers and there are few ad network which offer both CPM and CPC like Google Adsense, Adsoptimal, Clicksor, Infolinks. As you can see the image above and according to your choice needs, requirements, website types you can select preferred Netowrk.